In 1849, Union Fort was built in what's now Midvale to guard residents against perceived threats from local Native Americans. Jehu and Sarah Cox donated their farm for the building of the fort, which was never completed or used. The Coxes didn't get back the 10 acres of land they'd donated, but their white adobe home remained until the '90s, when the area was demolished to build the Family Center at Fort Union (900 E. Fort Union Blvd.). The little white house was rebuilt on the northeast corner of the shopping center, and now Jehu and Sarah's great-grandson Marion Cox, after 14 requests to the county council, has approval to build a memorial statue on the site—but he has just over a year to raise the necessary $80,000. 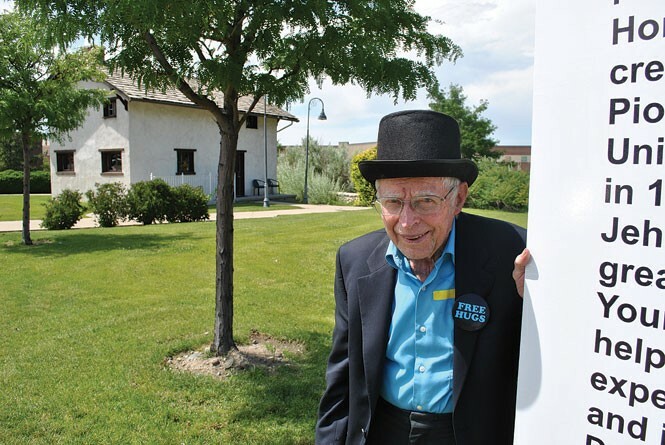 Cox, a retired carpenter and the 93-year-old honorary mayor of Fort Union, talked with City Weekly about his decades-long efforts to raise awareness of this little-known chapter of Utah history. Visit JehuAndSarah.blogspot.com to donate or learn more. How did you find out about your great-grandparents' story? I wasn't really involved until '57, when I got a book that said Jehu Cox on it. And I didn't know where the house was. But then a man asked me to help put a foundation under a house he had moved over to 1100 East, and when we called the inspector, I said, "Someplace over here is my great-grandfather's house." And he walked over there said, "See that?" He took me down and we stood on the porch. It was so special. What have you learned about your ancestors? The northeast corner wasn't walled in—it wasn't finished. I think Jehu was pretty good with the Indians, because the Indians came and took some of the residents' stock, and the boys followed after them. And [the Coxes'] son Elias was the only one who came out. The chief said, "Leave him alone, he's Jehu's son." Elias was my grandfather, but I never met him. What inspired you to take up this cause for the memorial? I lost my wife on the 19th of May 2011, and that gave me more time. I gotta have something to do, some reason to get up in the morning. How will you be raising money this summer? I'm hoping that we can put some tents up here. It's zoned recreation/commercial—so maybe we could have an auction, too. I'd like to stay out here overnight to see if I couldn't excite something to get some donations. I'd like to get a strobe light—wouldn't that be neat? I got a lot of dreams, and sometimes it works. I'll be in the Cottonwood Heights parade on July 24, and in August, they have the one in Midvale.